When a loved one has passed, this radiant spray of red and orange flowers will be a reminder of happy times past that will never be forgotten. • This stunning arrangement includes orange Asiatic lilies, red gladioli, green carnations, peach hypericum, emerald palm, red ti leaves, and accented with assorted greenery. 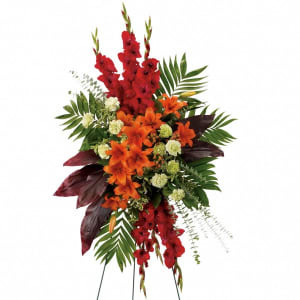 • All arrangements from the Sympathy Store are hand-designed and arranged by a local florist. • An appropriate gift to be sent by a family member, friend, or business associate. 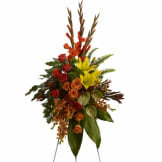 • Delivered directly to the funeral home, church, or memorial service. 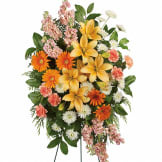 • Measures approximately 31" W X 50"H.
Flowers will be received by a Jay B Smith Funeral Homes, Inc.'s staff. It was gorgeous and quite different from the run of the mill options. It was as pictured. It was a lovely floral arrangement. The 'New Sunrise Spray' was absolutely beautiful, fresh and bright and larger than I expected. Ordering online from The Sympathy Store was great. Very Pleased with this arrangement. 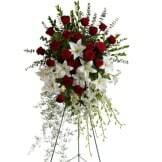 It was a beautiful spray and a really nice size and all the flowers were very fresh. I ordered flowers for a family members funeral at 1030 am and the service was to begin at 1pm the same day. The florist fix not have the above arrangement that I ordered and I was contacted within 30 minutes of ordering of this. The replacement flowers were beautiful and the flowers arrived on time. Often with on line orders, you never know if it was really as it looked in the ad. However, I had an opportunity to see this arrangement after it was delivered to the service and it was absolutely beautiful and exactly as advertised. Would not hesitate to recommend using this florist. Gorgeous Spray and excellent service!!! I am very happy with the flowers. They were just perfect. Thank you so much!! All of our flowers are designed and delivered by hand from a local florist in in Fenton.